Mary Draper Ingles was one of the pioneers who settled the western frontier of Virginia. In 1755, she was captured by Shawnee Indians who brought her, along with her children, to a Shawnee village near what is now Cincinnati. She escaped and walked more than 500 miles to get home, traveling through the New River Gorge in the months of November and December. Mary's son, Thomas, also returned to his family, but after thirteen years of captivity. His story represents that of Europeans who acclimated to Indian life, then returned to their families and were torn between the two worlds. 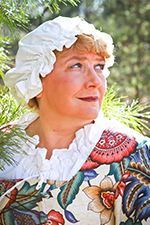 Vuranch's Mary Draper Ingles presents a unique perspective on frontier culture and tells how it was to be a white settler on the outer fringes of the 'civilized' world. But Mary can also talk about her son Thomas and the interaction of white and Native American cultures.